ST. AUGUSTINE, Fla. (March 28, 2015) – Hundreds of military leaders and dignitaries gathered at the World Golf Village on Saturday evening to pay tribute to the Guardsman and Airman who has led the Florida National Guard over the past five years. 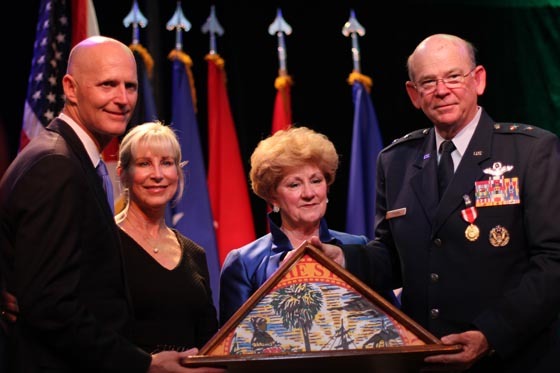 Maj. Gen. Emmett Titshaw Jr. – who has served as Florida’s Adjutant General since June 2010 – was honored during the banquet which included numerous distinguished well-wishers such as: Gov. Rick Scott; Chief of the National Guard Bureau Gen. Frank Grass; Director of FEMA Craig Fugate; and former Chief of the National Guard Bureau (ret.) Craig McKinley. The evening marked the end of Titshaw’s last full day as Florida’s Adjutant General, as he prepared to pass the reins to incoming Adjutant General of Florida Maj. Gen. Michael Calhoun on Sunday morning during an official change of command. During the evening ceremony Gov. Scott presented Titshaw with the Florida Cross for serving as the governor’s senior military advisor during his period as the adjutant general. 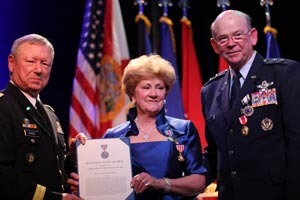 The citation for the award listed Titshaw’s numerous accomplishments as the adjutant general, including: leading the governor’s base commander meetings; helping establish relationships to spearhead legislative actions to support Florida Guardsmen and their families; and initiating programs to cut unemployment rates among drill-status Guardsmen. Grass highlighted portions of Titshaw’s career, including his time as a fighter pilot and his support to numerous domestic response missions. He also lauded Titshaw’s leadership while preparing Florida Guardsmen to deploy overseas for federal missions. Awards were also presented during the evening to the Titshaws on behalf of several other agencies including: the Florida Army National Guard; the Florida Air National Guard; the Kentucky, Indiana and Alabama National Guards; the City of St. Augustine; the City of Jacksonville; and the Florida Department of Veterans Affairs. A special pre-taped video presentation from the Chief of Staff of the Air Force Gen. Mark Welsh was also shown during the event. Titshaw enlisted in the Florida Air National Guard in May 1970 and received a direct commission the same year. In 1972, he completed Undergraduate Pilot Training at Columbus Air Force Base, Miss., receiving the Distinguished Graduate Award. After earning his wings, he was assigned as a Squadron fighter pilot with the 159th Fighter Interceptor Squadron in Jacksonville. After successive assignments with the 125th Fighter Interceptor Group – later designated the 125th Fighter Wing – and other high-profile commands, he was selected to follow Maj. Gen. Douglas Burnett as the Adjutant General of Florida in 2010.